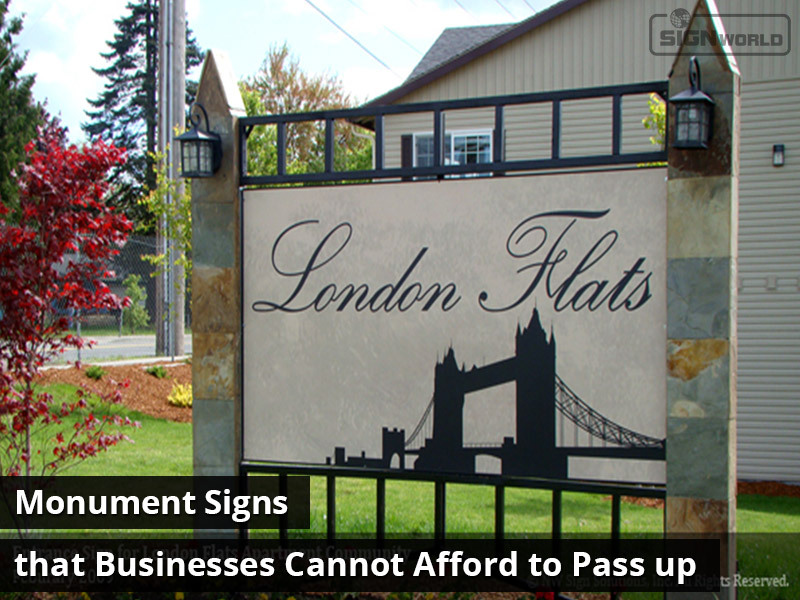 Some of the larger signs created by Signworld businesses are monument signs. Commonly found in front of subdivisions, business parks, schools, or churches, these are big sign structures. From rustic and traditional to corporate looking and modern, there is an array of styles that monument signs come in. They can be easily matched to any building type because of the different materials available. Plus, aluminum, stone, high impact laminate, wood, and brick are among the many finishes to choose from. A foam core based panel is used for a lot of today’s monument signs. For the larger ones, these will also have a wooden frame on the inside for added support. Then, for protection, the sign is covered with a hard resin polyurethane coat. The sign can then get a synthetic stucco finish with acrylic texture. Before it is applied, the textured finish is colored. You can pick from almost any color if you want the sign finish to match the finish of the base and the columns or the company’s colors. In order to color match the stucco finish, customers will sometimes send a stone or brick sample from their building. They typically also want similar colors for the supporting structure of the sign. Using metal studs in the back of the letters, the lettering is stud mounted to the sign face by fitting the letters directly into pre-drilled holes. Construction adhesive then holds them in place. The letters can also be directly engraved into the material. This makes the sign a one piece construction. This is a great option for businesses that want a sign that will last for many years. Rather than using a foam core, monument signs can also be made from an aluminum panel. Inside the sign itself, there will still need to be a wooden support frame, though, since aluminum is so heavy. Concrete and brick can also be used to build monument signs. In this instance, the sign panel would be mounted directly to the structure. This is the more stable and heavier option. However, it is also more expensive. A mason would be needed to install any footers and to build the structure. Most people assume that concrete and brick are the most common materials used for monument signs, but that simply is not the case. When you take the entire structure and signage into consideration, many monument signs only weigh around 200 pounds. This is because foam is used to make the faux brick and stones. Like a sturdy fence post, the posts used for the monument sign are secured with concrete. The monument sign is brought in on a truck and lifted and secured onto the posts. In the end, most passersby cannot tell what material was used for the sign. Feel free to contact us for more information if you are interested in learning how you can become a successful sign company owner and if you want to know more about Signworld.